Many lawyers offer basic estate planning services, and are able to provide valuable, traditional tools such as a will, durable power of attorney, and advance health care directive. You should definitely have these documents in place, and we can help, but we also encourage you to contact us to discuss whether more complete, innovative planning strategies and tools will benefit your family. The Levinson Firm, LLC’s central focus is on asset protection for seniors and their families, whether in crisis or a planning mode. Among our range of elder law services, we help people pressed to find and pay for quality nursing home care for a loved one, as well as seniors who want to prepare in advance for this possibility. We welcome (and frequently receive) estate planning referrals from financial planners. We also provide a wealth of free information to seniors and their families on key issues in our field. 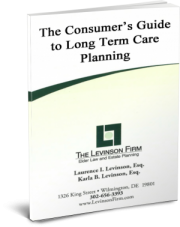 Click here to request a free long-term care guide that may help you better evaluate your own needs — or simply call today and request an informative consultation.